Evolution Ability Enhance [Threads Connection] – Summon thread and needle to connect the target enemy to another random enemy. When either of the connected enemies is inflicted with Frozen, Daze, Sleep, Morph, Silence, Provoke, or Confuse, there is a 40% chance that the other connected enemy to receive the same status. Needle’s HP and DEF is 50% and 70% of the target’s respectively. Upon Evolving, 70% of the damage received by one of the connected enemies would be transferred to the other enemy. The transferred control status and damage would not trigger Passive or Soul effects. Kosodenote’s signature skill is [Connected Thread] and it does not depend on Soul effects. Therefore, there really isn’t much limitation to her Soul choices. With PVE in mind, I chose Fortune Cat since she’s really fast and can act as a source of Orb when she’s summoning Needle. Other choices are completely viable depending on the team set up. SPD is always important for support. Effect RES is just there so that she does not get limited in action. HP is there for survivability. If you want to make her as a secondary DPS, feel free to use ATK % and Crit %. Her ATK and Crit is not super high but should be good enough as a secondary; especially when her Special Skill is attack oriented. Description Summon thread and needle to connect the target enemy to another random enemy. When either of the connected enemies is inflicted with Frozen, Daze, Sleep, Morph, Silence, Provoke, or Confuse, there is a 40% chance that the other connected enemy to receive the same status. Needle’s HP and DEF is 50% and 70% of the target’s respectively. Upon Evolving, 70% of the damage received by one of the connected enemies would be transferred to the other enemy. The transferred control status and damage would not trigger Passive or Soul effects. This set up takes Kosodenote’s synergy with Ushi no Toki into account. The catch is, of course, all units need to be fast so the enemies don’t budge into the attack sequence. The ideal situation is to take out two enemies in the first attack with Hakuro, then a third one when Kagura let Hakuro acts again. Another variation is to use Kamaitachi in place of Ushi to ensure all your units gets to act first. Of course, this type of double accelerator is subjected to the wrath of Momo at high-level Duel. In PVP, Kosodenote would have better luck partnering up with Enma to extend the control to an additional unit. Ignoring Effect HIT and Effect RES, Kosodenote could sometimes control units that otherwise couldn’t be controlled. Ushi no Toki – The Shikigami that is closest to Kosodnote is probably Ushi no Toki. For one, they both summon another object onto the battlefield. For another, they both transfer damage. The difference is that Ushi amplifies damage on one enemy whereas Kosodenote spread that damage to another target. In addition, Kosodenote also spread control effect as well. The good thing is that these two actually complements each other. While Ushi’s straw doll takes the summon spot on the enemy side, Kosodenote’s Needle takes own side. This means they coexist. By using them both, the amplified and spread damage would be huge. This type of set up is ideal for PVE. Status transfer does not take Effect RES and Effect HIT into account and is purely a probability according to the skill. Therefore, 60% chance is actually quite viable. Needle is a summoned unit on own side. Therefore she is not compatible with the likes of Ebisu. Needle would stay in battle for 2 turns before it disappears. Needle does not transfer damage that has been negated by shields. This means shield skills can counter Kosodonote. Can transfer multiple status effects with each effect having 60% chance to transfer. The likes of Enma or Mimic, who can inflict multiple effects, have the advantage in this regard. In auto mode, Kosodonote would random targeting Connected Thread when there are two or more enemies present. When there is one enemy left, she would use Knitting Needle. Kosodenote’s best use would be PVE against Bosses with several minions. She’s not an attacker so we can’t expect her to carry fodders. She does have AOE attacking skill so with good souls she can take that role. Though I doubt you don’t have a better AOE DPS than her. I am a bit conservative with her use in PVP. Extending damage and status effect sound very good on paper but the randomness may limit her use. Nonetheless, her skills would be troublesome for enemies when the correct Shikigamis are linked. Kosodenote can fit into a team to beat Soul 10 if you don’t have enough DPSs to get the job done. She’s not really all that useful for your daily run though. I see Kosodenote’s main use to be working with Ushi no Toki to amplify damage. This means we should see her more in PVEs. She should be able to make an impact in PVP as well by duplicating controls. Notable partners would be Enma, Red Imp, etc. The only drawback is Needle is randomly linking enemies so there would be unreliable times. 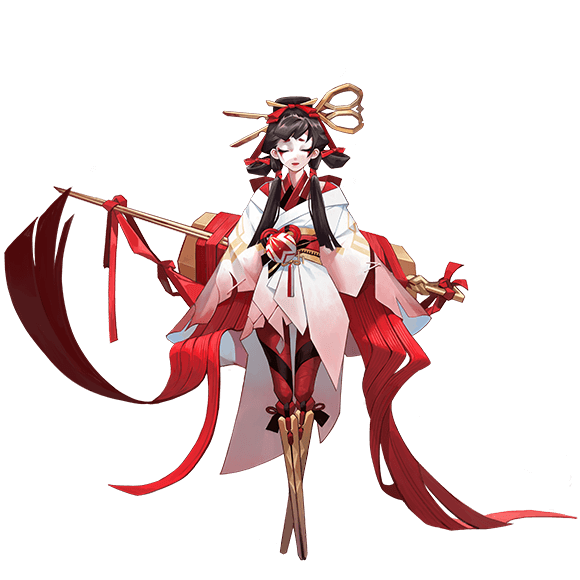 Overall, she is not a bad Shikigami to put in the back pocket but I wouldn’t prioritize her to G6 when there are more suitable candidates.